News flash: adorable three-toed sloths in Nicaragua aren’t camera shy! We’re freaking out as much as you are. Last summer, a particularly brave little sloth at Nicaragua’s Volcán Mombacho Nature Reserve not only posed for the camera, but started taking a #selfie video that would make Kim Kardashian jealous. The pleasantly surprised tourists can be seen waving in the background of what is sure to be their favorite vacation video EVER. Beyond their obvious ability to be super photogenic, how much do you actually know about sloths? Prepare to become a sloth expert. First, yes, these cuddly critters are in fact the world’s slowest mammals. 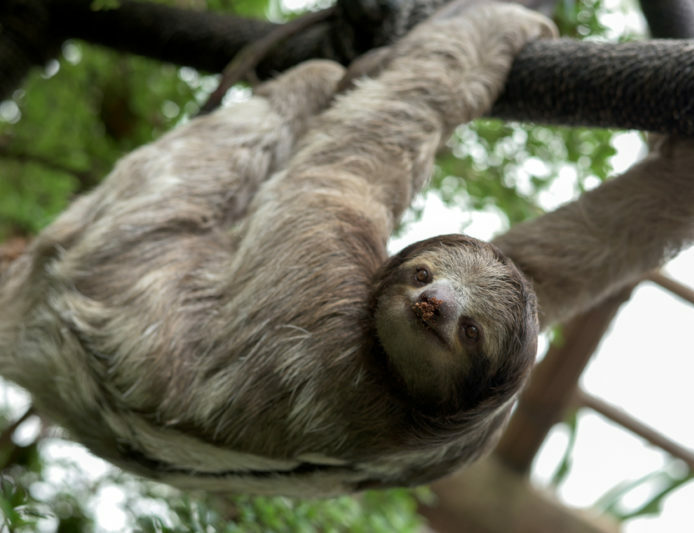 Not only do they generally spend 15-20 hours a day sleeping, but even three-toed sloths “on the go” move so slowly that algae literally grows on their furry coats! But don’t let this masquerade of laziness fool you. Just because sloths aren’t speed demons doesn’t mean they aren’t powerful. Though they can only cover about 40 yards a day in trees and have to crawl even slower on land, sloths are surprisingly good swimmers. Don’t be surprised if you’re fishing in the rainforest and you see one of these fuzzy cuties zip by! Chances are high that you’re going to hear a sloth long before you ever see one. If you’re trying to catch a glimpse, listen for a long, high pitched call of “aahh-eeeeeee” and you’ll know you’re getting close. If you’re not convinced sloths are cute, do yourself a favor and watch this video!